So here we are into January. Thanks again to everyone that has supported our kit experience. We appreciate your emails and your orders. Last month was quite hectic. we would do something calm and cool. a kit that was jam packed with goodies. our own collection of charms and findings. You could call it a new obsession of ours at Jack & Cat. metal findings that we could add to our pieces. We wanted wings, gears, cogs, and more wings. We wanted cameos of various sorts. and as many crowns as we could find. We wanted mini frames of all sorts. filigree that we can alter and patina. We wanted more eighties plastic charms. across local bead stores and the Internet. 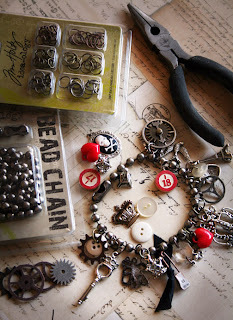 of cool eclectic charms and findings. charming or charmless.. no in between. Perfect .. easy clasp.. and natural holds for each charm. Rustic.. and had more appeal for us... than a chain. all the above mentioned in this kit for you. charms grows as ours did. This kit is all about the charm! An assortment of over 25 various charms. Click on pics for close up. This looks great! Count me in! I just ordered mine!